ASTM A312 SS 310H Welded Tubes Suppliers, Stainless Steel 310H Welded Tubing Manufaturer, Stainless Steel 310H ERW Tubes Stockholder, SS 310H ERW Tubes Exporter in india. MBM Tubes is one of the renowned exporter, manufacturer, stockist, supplier and stock holder of a qualitative range of Stainless Steel 310H Welded Tubes that are being designed as per the national and international standard quality of raw materials. SS 310H Welded Tubes are being used in different types of industries such as pumps & petrochemicals, sugar mills, cement & construction industries, and so on. A few significant characteristics of SS 310H ERW Tubes are that they have higher corrosion resistance, enhanced tensile strength and improved yield strength. We offer Stainless Steel 310H ERW Tubes in different sizes, thickness and standards as per made to order requirements given by our customers. 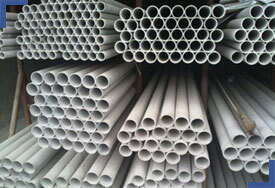 Stainless Steel 310H Welded Tubes Stockist, SS 310H DIN Welded Tubes, Stainless Steel 310H ERW Tubes, SS UNS S31009 Welded Tubes, Stainless Steel 310H Welded Tubing in India.